Speaker Karu Jayasuriya speaking at the launch of the National Action Plan for Combating Bribery and Corruption on Monday, said the Action Plan should be endorsed by all political parties irrespective of political affiliations. The Commission to Investigate Bribery or Corruption (CIABOC) would have his fullest support in the realisation of the National Action Plan, the Speaker also said. 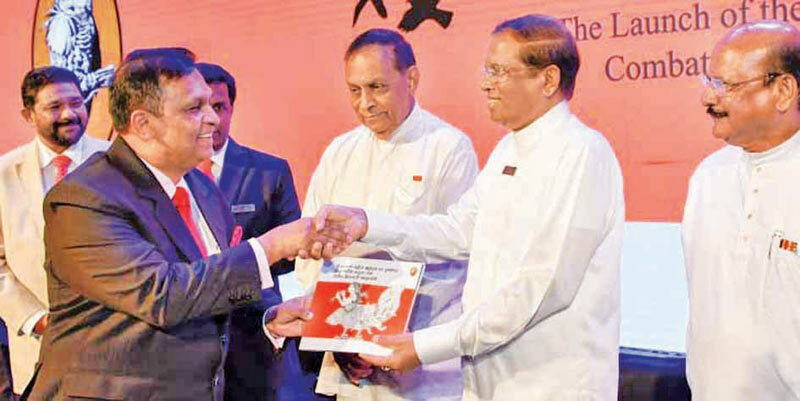 CIABOC Director General Sarath Jayamanne presented the Speaker and President Maithripala Sirisena with copies of the National Action Plan and the four handbooks containing the proposals set forth regarding graft, conflict of interest, reforms of laws, and the strengthening of organisations including CIABOC, police and the Attorney General’s department. Speaker Jayasuriya said the National Action Plan is a culmination of a vision that had been crafted after many consultations and that it was finally in a form that was both actionable and could be used to hold others to account. The Speaker, referring to the ownership of the publication, said it was the duty of every individual to ensure that they act with responsibility and in accordance with the Action Plan. CIABOC along with the Presidential Secretariat and the Public Administration Ministry brought together stakeholder institutions to collect information for the Action Plan. There had been 50 such consultations, out of which four were held in Parliament. The Action Plan sets out strategies for combating bribery and corruption in Sri Lanka, which include preventative measures, value-based education, community engagement, institutional strengthening of CIABOC and other law enforcement agencies, and law and policy reforms. Along with the Action Plan, four handbooks were released, which set out the decisive factors meant to shape the course of combating bribery and corruption. The four handbooks include the draft proposal on gift rules, draft proposal on conflict of interest, integrity handbook for state officials, and proposed amendments to laws related to bribery, declaration of assets and liabilities, CIABOC, regulation of election campaign finance, and whistleblower protection. The Action Plan has been translated into both Tamil and Sinhala and can be downloaded from the CIABOC official website, www.ciaboc.gov.lk.